Apple’s 2019 iPhones are still several months away, but we have already seen a bunch of leaks. Just like last year, the tech giant is expected to launch three iPhones in September this year, which will succeed the iPhone XS, XS Max, and iPhone XR. Now folks at SlashLeaks have obtained leaked iPhone 11 schematics that hint at a design similar to what Steve H.McFly shared a couple of months ago. How do you like the camera bump in the iPhone 11 schematics? The schematics were originally posted by Chinese Twitter user Mr-white, who claimed it’s the “New iPhone XR.” However, the image might be representing the iPhone 11 or iPhone 11 Max. According to the rumor mill, the iPhone XR successor would feature a dual camera setup on the back, similar to the current iPhone XS. But at least one variant of iPhone 11 is said to sport triple rear cameras. The schematics show a device with three lenses on the back. The image shows a device whose dimensions appear to be consistent with last year’s models. It shows off the upcoming phone’s metal chassis and the welding pattern. There is no way to verify the authenticity of the leaked image, though Mr-white has leaked prototypes of Apple devices in the past. Just like Steve H.McFly’s prototype design leaked in January, this new image shows a triple camera setup on the back. The cameras are arranged in a weird square-shaped bulge in the top left corner. The square camera bulge also includes an LED flash. It doesn’t look attractive at all. It’s unclear why Apple opted for a square arrangement instead of the vertical or horizontal alignment of camera lenses. You can see a total of five holes in the top left corner of the phone. Three of them are for the cameras, one for the LED flash, and another for the microphone. According to the Wall Street Journal, the triple camera system will appear only on the larger iPhone 11 Max while the other two models would get dual cameras. The iPhone 11 schematics also show cutouts for the SIM card and Lightning port. 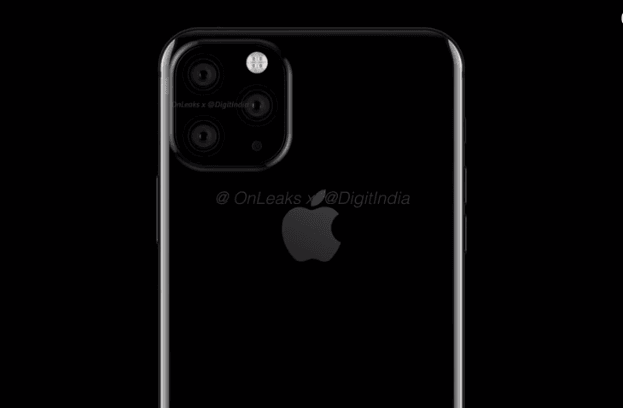 Past reports have indicated that the iPhone 11 Max would get two 14MP lenses and a 10MP sensor on the rear panel. According to Bloomberg, one of the three cameras will be a Time-of-Flight 3D sensor that measures the time it takes for the light to bounce off an object to create an accurate 3D image of the scene. If used in the iPhone 11 Max, it will not only enhance portrait photography but also improve the augmented reality experience. The upcoming iPhones would bring only minor external changes. You can expect them to look similar to their respective predecessors. They will likely have smaller bezels due to the reduction in the size of the TrueDepth camera components. The Face ID technology would also get an upgrade. The iPhone 11 should run Apple’s custom A13 processor and the iOS 13 software out of the box. According to recent reports, the iOS 13 would bring a system-wide Dark Mode for easier night-time viewing, and many iPad-specific improvements such as a revamped Files app, a new Home screen, and the ability to tab through different pages of the same app like pages in a web browser. Japanese blog Mac Otakara claims Apple will make a number of changes to the battery charging technology. The upcoming iPhones are said to support bidirectional wireless charging, allowing you to charge your Apple Watch, AirPods cases, and other compatible accessories by putting them on the back of your iPhone. The 2019 iPhones will also ship with an 18W USB-C charger, which means Apple is finally saying goodbye to the ridiculously slow 5W charger that comes with the existing iPhones. Apple started shipping the 18W power adapter with the iPad Pro last year. The new iPhones are also said to ship with a USB-C to Lightning cable, though they will continue to rely on the Lightning connector. If Apple indeed chooses to ship the upcoming iPhones with an 18W fast charger and USB Type-C to Lightning cable, it could hurt the company’s revenue. The iPhone maker currently ships the flagship iPhones with a slower 5W charger and USB-A to Lightning cable. It separately sells the 18W charger for $29 and the USB-C to Lightning cable for $19. But Apple is not the kind of company that compromises on its profit margins. With upgraded charging technologies, you could expect an increase in the prices of upcoming iPhones.